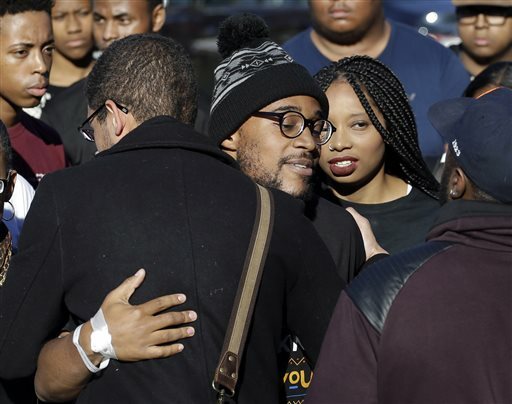 Jonathan Butler, center, hugs supporters after addressing a crowd following the announcement that University of Missouri System President Tim Wolfe would resign, Monday, Nov. 9, 2015, at the university in Columbia, Mo. Butler has ended his hunger strike as a result of the resignation. 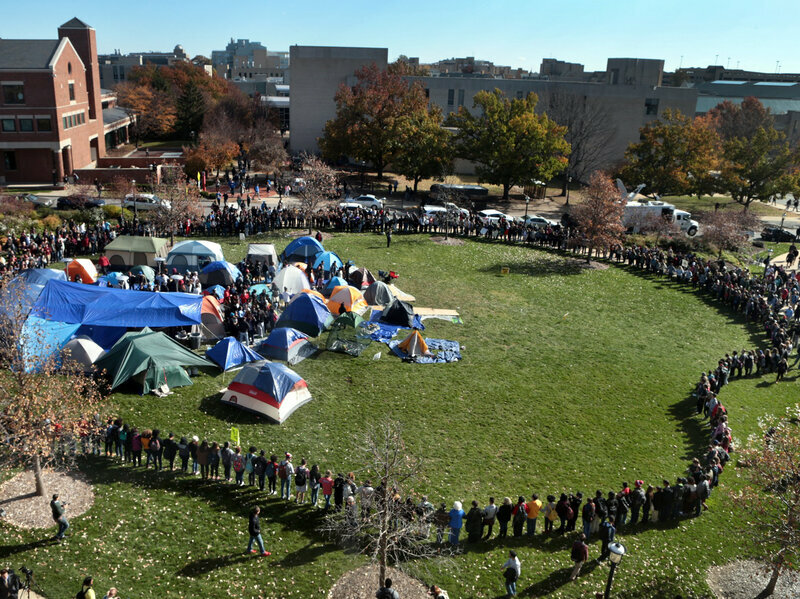 Brian Kratzer&apos;s students had a singularly complex assignment in recent days: They had to cover the protests at the University of Missouri&apos;s flagship campus in Columbia at a time when those protests had turned singularly hostile to coverage — and reporters. Astonishingly, some of those most hostile turned out to be on the university&apos;s faculty and staff. "Here was an activist group that needed us to get their message out and they were trying to shut us down," said Kratzer, the director of photography at the city&apos;s morning daily, the Columbia Missourian. "Maybe they didn&apos;t understand how public spaces work." Kratzer is also an assistant professor at Mizzou&apos;s prestigious journalism school, which runs the paper. He says he has witnessed what he&apos;s called an "a la carte" approach to the First Amendment, in which some rights were observed and others ignored. No matter what you think of their cause, the intimidation was a serious mistake. Then again, you expect college students to make mistakes during their years on campus. It&apos;s part of the point of coming to campus. You screw up, you learn, and you take those lessons with you. You don&apos;t expect people holding positions of authority to make those same mistakes. Yet in several instances, faculty members and administrators were documented — some on video — harassing those merely seeking to report what was unquestionably news while standing in an unquestionably public space. That administrator, Janna Basler, is the university&apos;s assistant director of Greek life and leadership in the student life division. But that&apos;s part of the education, too, for the aspiring journalists and for the people they cover. Kratzer said another professor had berated one of his photographers so severely on Saturday that the student texted to say he didn&apos;t think he could return for more. For his part, Kratzer seized the moment to help theMissourian document the campus protests professionally and to exhibit civic responsibility as well. He has reminded editors and staffers to remain courteous toward the protesters. "Theirs is a cause they feel passionately about," Kratzer said. "Let&apos;s approach this not as full of angst and anger, but as calm journalists." The dean of the journalism school, David Kurpius, put out a statement Tuesday praising Tai&apos;s restraint and reiterating the importance of the First Amendment. He said Click&apos;s courtesy cross appointment in the journalism school was being reviewed. There was no comment from the university system&apos;s board of curators about the denial of First Amendment rights for some of its students. Click&apos;s department chairman also reiterated First Amendment rights, and he could not speak about "personnel decisions." I am just about unyielding in my belief in Click&apos;s freedom of inquiry and expression. Yet, I cannot for the life of me understand the university&apos;s passivity in the face of her actions or those by others paid by the University of Missouri to help educate the state&apos;s youth. Those actions contradict everything the journalism school professes to stand for. It&apos;s taken too long for the university to respond. That may have something to do with the resignations of the university system president and the campus chancellor. "I regret the language and strategies I used, and sincerely apologize to the MU campus community, and journalists at large, for my behavior, and also for the way my actions have shifted attention away from the students&apos; campaign for justice." Those who physically interfered with young reporters will have to work hard to convince people they deserve the right to hold on to their jobs. But I&apos;m open to the argument. After all, that&apos;s implied by free speech too.